For some reason, the combination of cigar and the Steampunk goggles just seemed odd to me. Naturally, I had to record it. 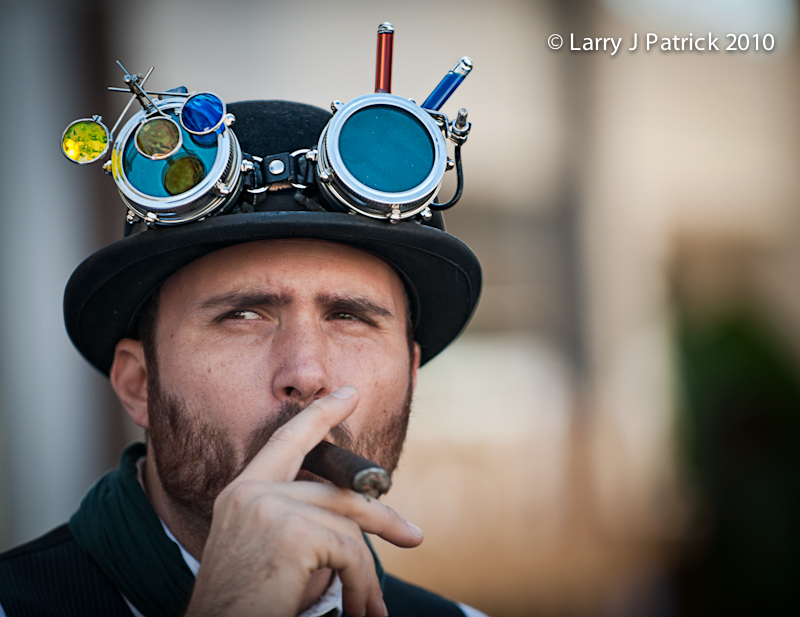 I wanted the image to showcase the goggles so I focused on the left three small lenses and then added a little sharpness and contrast to them in Lightroom 3. As a result, his face is a little soft which will bother some people, but my intent was to focus the viewer's attention on what I found unusual and interesting and that was not his face. Upon seeing the image on the computer, I felt that the soft background really set the subject off. Camera settings: Nikon D3, Nikon 70-200mm f/2.8 shot at 200mm, ISO 200, f/2.8 and 1/350th of a second. Lightroom 3—Adjusted white balance, added mid tone contrast and sharpness and contrast to the goggles. Don't see that attraction that you saw in this one. I do like the goggles and I do like your work.